Tom Cruise is now a well-known stunt junkie and his addiction is on full display in Mission Impossible: Rogue Nation. In the scene, Ethan Hunt (played by Cruise) hitches a ride on the outside of an Airbus A400M transport that quickly leaves the ground. Sure, there were safety harnesses, but that doesn’t make it a joy ride. The truth of the matter is that anytime you fly a strange configuration, especially one with a live human hanging on to the rear of the fuselage, you never know exactly what the results will be. The A400M has had its issues since filming this crazy scene last winter. A brand new A400M destined for the Turkish Air Force plummeted to the ground shortly after takeoff during an acceptance test flight last May. It ended up being a software issue with the aircraft’s engines that caused the deadly crash, causing the entire fleet to be grounded. After a fix was made, the A400Ms returned to the skies. 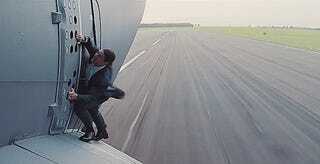 The Mission Impossible franchise is known for its awesome stunt sequences. Last time the MI gang got together Tom played Spiderman on the exterior of the Burj Dubai, which was equally as stomach turning as the A400M stunt. Say what you will about the guy’s personal life, but at least when you pay the $12 to see one of his movies you know he put some skin in the game.